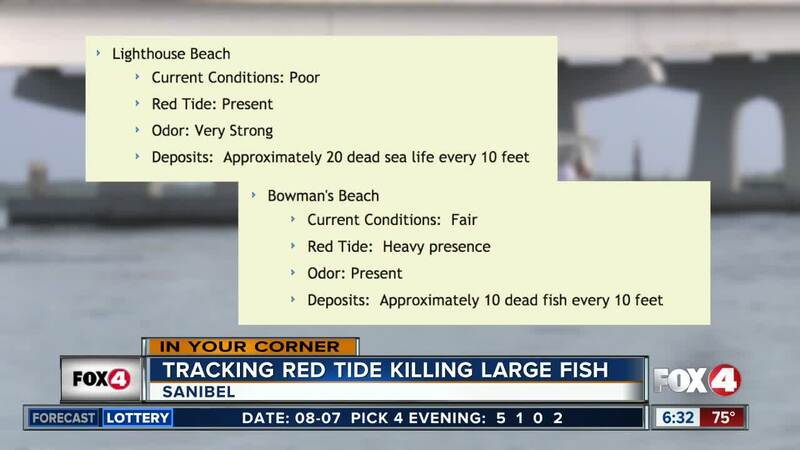 LEE COUNTY, Fla. -- A one-two punch of red tide and algae-filled lake water releases have had a devastating effect on sea life in Southwest Florida. The latest numbers from Lee County officials on Thursday reveal that well over 3 million pounds of fish have been removed from local coastlines. The county reports that contractors removing fish from Lee County beaches have amassed more than 1,400 tons of fish, and that crews in Sanibel have collected an additional 309 tons. Among the dead fish found include one dead Whale Shark on Sanibel, and numerous large goliath grouper and tarpon. Lee County has just received two new Sand Rake machines, purchased for $60,000 each, that are being immediately placed into service. The county has a grant agreement in place with DEP for reimbursement of $1.3 million to assist with red tide cleanup. The state funds are being supplemented by Tourist Development Tax reserves. A large coastal red tide bloom has plagued the Southwest Florida coast in recent weeks, stretching from Collier County all the way up to Manatee County. At the same time, the U.S. Army Corps of Engineers has been releasing excess water from Lake Okeechobee into the Caloosahatchee River, which empties into San Carlos Bay in Lee County. That water has led to the appearance of green and blue-green algae in the waters of Cape Coral and North Fort Myers. More updates from the county are posted HERE .